Nike dominated the leaderboard at the outdoor US Track & Field Nationals. Looking solely at the distance events (800, 1500, 3000 steeple, 5000, and 10,000), 16 of the 30 athletes (53%) who finished first, second, or third are sponsored by Nike. Nike’s men filled 11 of the 15 medal slots (73%) and won 4 of the 5 events (Duane Solomon‘s victory over Nick Symmonds prevented the sweep. Solomon represents Saucony). The women’s results were more “balanced” thanks in part to New Balance’s Jenny Simpson and Brenda Martinez and also because Alysia Montano, whose contract with Nike was up at the end of last year, is now signed with Asics. Nike women won two of the five events and took 5 of the 15 medal slots (33%). Nike also had the most participants in the finals of any shoe company, but its lead was less pronounced here. 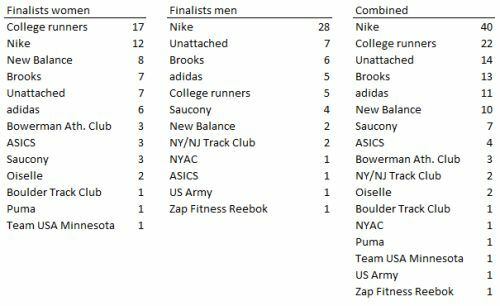 Nike fielded 12 of the 71 finalists for women (17%), 28 of the 63 finalists for men (44%) , and 40 of the 134 finalists overall (30%). Note that the data include runners at the starting line on the day of the event, not those who scratched. Meantime, off the track, sales of running shoes are booming, according to a running industry report by Running USA. And, among “core runners,” Nike here is not dominating; rather Asics (21.8%) and Brooks (21.6%) lead the pack. But if you look more generally at running shoe sales and apparel sales, according to data presented last year by SportsOneSource, Nike’s dominance off the track is in line with its performance on it.